Gentle enough to use on your face, body and even as a shampoo bar on your hair. 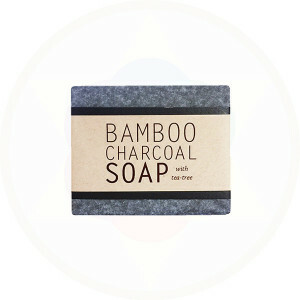 The combination of Bamboo and Charcoal with added Tea Tree oil detoxifies and deodorises while nourishing your skin with pure vegetable oils. Tea tree has antiseptic, antiviral, antifungal properties. To ensure the best possible quality, Kalyan's natural vegetable oil handcrafted soaps are made in small batches. The combination of four vegetable oils with carefully selected essential oils are blended to give you a variety of soaps to nourish and moisturise your skin. Olive oil, Coconut oil, Avocado oil, Castor oil, Essential oils, Bamboo, Charcoal, Lye, Distilled water.